The late style tool kit was different from the earlier tool kit in that it was not flocked or lined with felt. The inside was simply painted with the same gray as the lid. It could be placed on the old style wheel with clips, or it could be used on the newer style wheel since it had two carriage bolts passing through it which attached a flat bar across it with wing nuts. There are two decals inside the lid. One decal showed correct placement of the tools, while the other large crescent shaped decal had mounting diagrams for the kit on the different Volkswagen cars; 23001200A, 1300. 1500/1500A, and the 1600. This is an uncommon 6tool ki6t and not seen often. The stubby Phillips screwdriver has a much larger handle than the same 814-02A found in earlier tool kits. 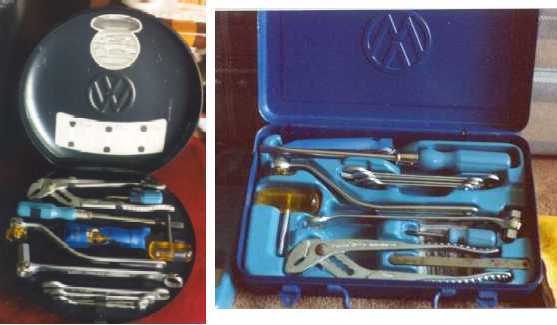 The rectangular tool kit was offered by Volkswagen in 1970. This tool kit came in a blue, rectangular metal box. It contained two plastic t5rays and had the Volkswagen logo on top. The bottom tray contains the tools listed below plus two polishing clothes. The top tray held the tools that came as standard equipment with every Volkswagen. These were the tools that came in a small vinyl pouch with the car, and were placed in the top tray. The same tools could be bound in a rectangular tool kit as the late model.